The world at the quantum level, at the scale of particles too small for the eye to see, is very strange. It’s possible, for instance, to have two particles that are “entangled” — that is, they function as if they were connected, even if they are many miles away from each other. 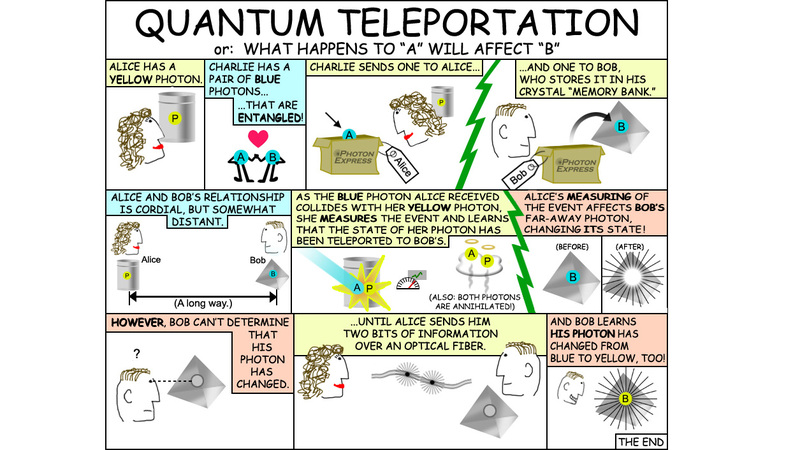 How quantum teleportation works is complicated, but an analogy for the principle behind it may help: Let’s say there are two people, Alice and Bob. Alice wants Bob to have a photon that’s in the same “state” as her photon, which we’ll call photon P. For the sake of this analogy, we’ll pretend that the “state” is a color, and photon P is yellow. A third person named Charlie sends out two entangled photons, photon A to Alice and photon B to Bob, which behave as if they are part of the same whole. Both of these photons start out as blue. “In an entangled system, each part is connected to one another in a fundamental way, such that any action performed on a part of the entangled system has an effect on the whole entangled system,” Marsili said. Alice’s two photons, P, which is yellow, and A, which is blue, “collide.” Alice measures the photons as they annihilate one another. Although P and A are destroyed in the crash, P’s yellow color is preserved. Because photon A and photon B are entangled, the yellow color is “teleported” to B. But in order to get photon B to become yellow, as photon P originally was, Alice needs to send Bob two bits of information to B the “classical” way — for example, by sending pulses of light over an optical fiber. “When Alice measures the state of her photon, Bob’s photon changes state as well, as if flipping a switch,” Marsili said. “But Bob cannot know how the switch flipped unless Alice sends him the bits of information classically.” Bob does not know that his photon has changed to yellow without that additional information. Quantum teleportation doesn’t mean someone can pop from New York to San Francisco instantaneously, but it seems like science fiction in the sense that the state of a particle (photon P) is destroyed at one location but imprinted on another remote system (photon B) without the two particles ever interacting. The researchers reached the record distance of 15.5 miles (25 kilometers) between “Alice” and “Bob” thanks to the ultrasensitive detectors developed at JPL-NIST. “Reaching this distance could not have been possible without the JPL NIST detectors,” said Félix Bussières at the University of Geneva, Switzerland, who is the lead author of the study. Quantum teleportation can be used to make systems, such as bank accounts, more secure over longer distances. This is also important to preventing attacks on communication channels in space. “If you’re communicating with your astronauts on Mars, you don’t want to have hackers break the encrypted channel and give them false information,” Marsili said.